LATEST UPDATE dated 27.03.2019 : Good News !! CBSE will make Extra Exam Centres in 10 Cities for Assam & Bihar. CTET Exam is scheduled on 07 July, 2019. Read full news from image below..
CBSE has announced CTET 2019 Exam Date. CTET Paper 1 & Paper 2 will conduct in July, 2019. Check Official CTET Exam Date from Image given below…. 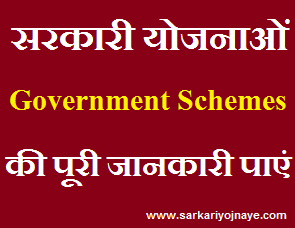 The Ministry of Human Resource Development, Govt. 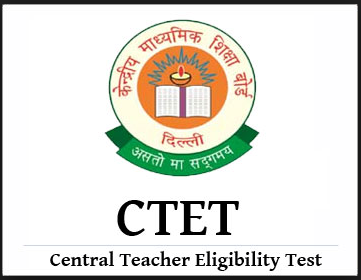 of India has entrusted the responsibility of conducting the Central Teacher Eligibility Test (CTET) to the Central Board of Secondary Education Delhi. one of the essential qualifications for a person to be eligible for appointment as a teacher in any of the schools referred to in Clause (n) of section 2 of the RTE Act is that he/she should pass the Teacher Eligibility Test (TET) which will be conducted by the appropriate Government in accordance with the Guidelines framed by the NCTE. Central Board of Secondary Education (CBSE) every year conducts Central Teacher Eligibility Test for Primary Level & Upper Primary Level. CBSE conducts two paper under CTET Exam. Paper 1 is for becoming teacher for Classes I-V Primary Stage & Paper 2 is for becoming Teacher for Classes VI-VIII Elementary Stage. 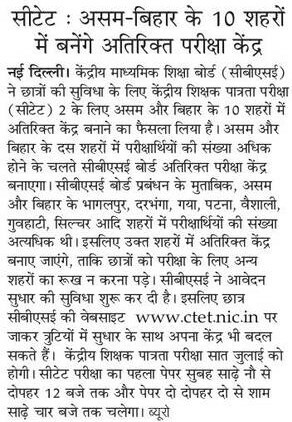 As Per Latest News, CBSE will organize CTET 2019 Exam in July, 2019. All questions in CTET will be Multiple Choice Questions (MCQs), with four alternatives out of which one answer will be correct. Each carrying one mark and there will be no negative marking. There will be 150 Questions carrying 150 Marks in both Paper 1 & Paper 2. Time Duration for both Papers will be 02:30 Hour (150 Minutes). CTET 2018 Paper 1 & Paper 2 will be conducted in 20 Languages. On the Home Page, You will find links for “Download CTET 2019 Admit Card for Paper 1” & “Download CTET 2018 Admit Card for Paper 2”. As per their Eligibility Criteria, Candidates can click on Admit Card link for Paper 1 & paper 2. Candidates will be able to Download Admit Card by using their details of registration no. & date of birth. Take Print out of your Admit Card & Attend CTET Exam with valid Identity Proof.